This is a great recipe for homestyle macaroni and cheese that will satisfy even the pickiest eaters. Even my gluten-loving kiddos ate this up and asked for seconds. This gluten-free macaroni & cheese bake is so full of cheesy goodness that you won’t even know the difference from the original! Proper selection of the gluten-free is pasta is crucial to the success of this dish. Some of them just turn to mush when you cook them….and that would be a casserole fail. I used the Hodgson’s Mill brown rice elbow macaroni and the Tinkyada rice pasta and both turned out great. The Tinkyada is actually my favorite. Be sure and cook it al dente and rinse under cold water to stop the cooking process. It will have plenty of time to finish plumping when you bake it in the oven. *I’ve made a modification to the original recipe and added two beaten eggs to the cheese mixture before baking. 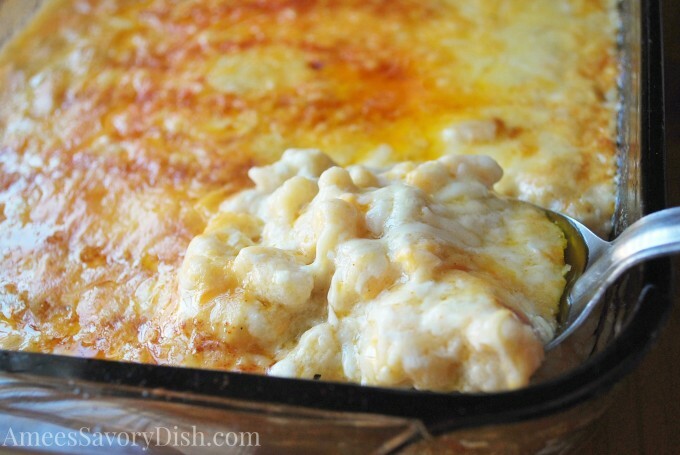 It turns out more like southern macaroni bake and was absolutely delicious! If you like more of a macaroni casserole texture, add the eggs. If you want a more creamy mac and cheese, just follow the original recipe. Cook macaroni "al-dente" according to package directions, immediately drain in a colander and rinse with cold water. Blend in flour, salt, peppers and dry mustard with a whisk, then add milk. Cook until beginning to thicken and smooth. Add half of the cheese and stir until blended. Pour macaroni into a 9x13" pan sprayed with cooking spray and add cheese mixture. Stir until mixed and then top with remaining cheese. Sprinkle with paprika and bake for 25-30 minutes until set and lightly golden on top.